The 'Canada Lily' is perhaps one of the most beloved and popular of the Eastern North American species. 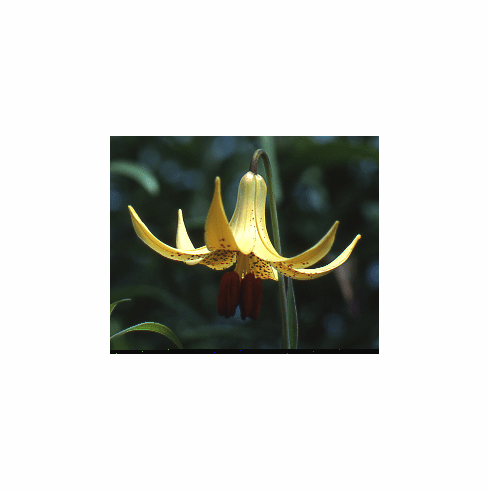 Also known as the 'Meadow Lily' it is commonly found at the edges of open meadows in damp, acidic, well drained soils. In the garden Lilium canadense appreciates generous additions of leaf mold or peat moss to the soil. Producing yellow, Turk's Cap flowers with varying amounts of spots, Lilium canadense adds grace and charm to the garden that no modern hybrid can match. This species lily can take from four to six years to flower from seed and another three to four years to reach a commercial size. Shown is the variant 'flavum', the best known of the species. Photo inset #1 is of a very finely grown stem of L. canadense provided by William Holden. Copyright William Holden, all rights reserved. Photo inset #2 is of L. canadense habitat in NH, provided by Dr. Richard M Adams. Coypright Dr. Richard M. Adams, all rights reserved. Photo inset #3 is of L. canadense grown by Gene Mirro. Copyright Gene Mirro, all rights reserved.